(Nanowerk News) In the 2010/11 winter semester, an ambitious teaching project of nine universities and research institutions started in the southern area of the national "Competence Consortium Electrochemistry". Every two years, the institutions involved will organize lectures and seminars that will be transmitted live by video to the other locations. In this semester, KIT and the Justus Liebig University of Gießen (JLU) will start. Scene of a lecture. The Competence Consortium Electrochemistry arranges for such lectures being transmitted live by video to several universities and research institutions. Several scientists of KIT will present a lecture on "Characterization Methods and Modeling in Battery Research". Professor Jürgen Janek from the JLU will give a lecture about "Applied Electrochemis-try – Basis of Advanced Physico-Chemical Technologies". A video conference system installed at all locations involved is used to net-work students and the scientific staff at the lecture halls and seminar rooms in a digital auditorium that can communicate with the respective lecturer with hardly any barriers during his lecture. The southern area of the consortium is coordinated by Professor Horst Hahn, Director of the KIT Institute of Nanotechnology. The spokesman is Professor Werner Tillmetz (ZSW Ulm). The education and training program is coordinated by Professor Bernd Smarsly and Professor Jürgen Janek (both JLU). Professor Karsten Albe (Technical University of Darmstadt) is responsible for the technical management of the project. Karlsruhe Institute of Technology (KIT) is a public corporation and state institution of Baden-Württemberg. 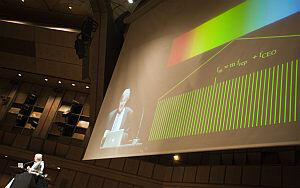 It fulfills the mission of a university and the mission of a national research center of the Helmholtz Association. KIT pursues its tasks in the knowledge triangle of research, teaching, and innovation.